This is going to be a very exciting blog post! I received a very happy surprise a few weeks ago and have been wearing and using them ever since. OK so the suspense is over, feast your eyes below on the New Goody Hair DoubleWear accessories. These are genius, a headband which doubles up as a necklace, or a set of 3 bracelets which double up as hair elastics. No need to hide your well worn and used hair bands on your wrist now, you can wear these with pride and show them off! You'll soon have your friends and family asking you about them. I'm always putting a hair elastic around my wrist, I wear my hair up and down throughout the day because I'm either running around after my little ones or I'm fulfilling the house-hold duties. Sometimes I just need to pull my hair out of my face, do know what I mean? 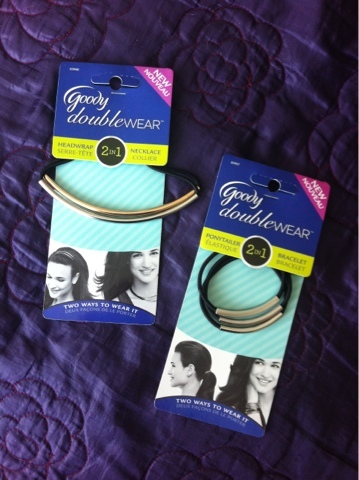 The Goody hair DoubleWear bands have been a real great surprise for me, I've been wearing either the hair elastics or the headbands on a daily basis. The hair elastics come in a pack of 3 in silver or gold, 2 of the bands have a polished finish whereas the 3rd band has an embossed finish. I have the silver finish and love them so much that I'll be popping into Boots to pick up the gold ones! The headbands/wraps come in a set of 2, silver and gold with both a polished finish. I instantly took a liking to the gold headband which actually reminded me of a soft rose gold. 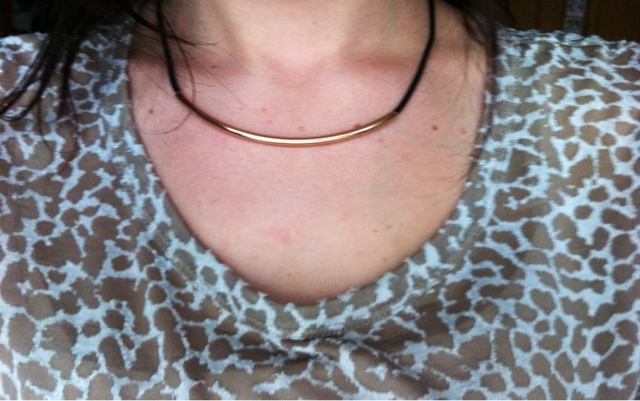 Unfortunately my son decided to wear it as necklace because he was dressing up as a pirate and then lost it! However another BIG bonus is the price, these are only £3.75 each. So I will happily pick up another couple sets. These not only serve a purpose they look fab and on-trend, seriously ladies you NEED these. Next time you're in Boots pick them up!